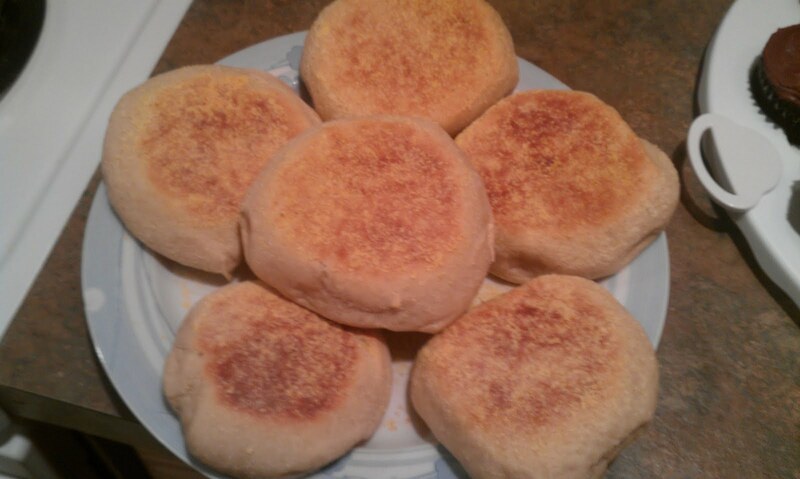 A friend of mine Angela found this awesome English Muffin Recipe on this Tracey’s blog and I’m snatching this one up because it is just so easy and DELICIOUS. In the bowl of a stand mixer fitted with the paddle attachment, combine the flour, sugar, salt and yeast. Mix in the butter (or shortening) and 3/4 cup of milk (or buttermilk). Add just enough of the remaining milk to form a dough and incorporate the dry ingredients. Sprinkle flour on the counter, turn the dough out of the bowl, and knead by hand for about 10 minutes. The dough should be tacky (but not sticky), should pass the windowpane test and register 77 to 81 F. Transfer the dough to a lightly oiled bowl and roll to coat. Cover the bowl with plastic wrap and let rise for about an hour, or until the dough doubles in size. 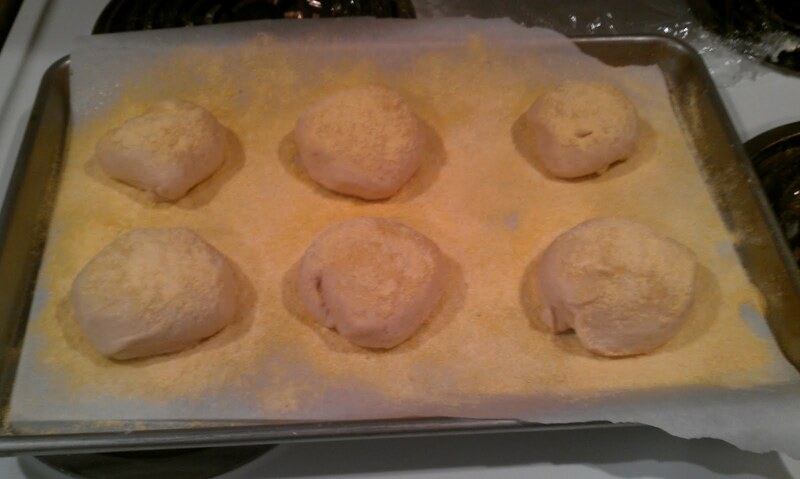 Divide the dough into 6 equal pieces and shape into balls. Lay parchment paper on a baking sheet and spray lightly with oil. Sprinkle with cornmeal. Move the dough balls to the baking sheet, spacing them evenly with room to rise. Mist the rolls lightly with oil and sprinkle with cornmeal then cover the pan loosely with plastic wrap and allow to rise another hour, or until the rolls are nearly double in size. Preheat the oven to 350 F. Heat a flat griddle to medium (350 F) (you can also use a skillet on the stovetop if you don’t have a griddle). Brush the griddle lightly with oil and gently transfer the dough balls to the griddle a few at a time. Allow them to cook for 5-8 minutes or until the bottoms are a rich golden brown color. Carefully flip and cook the other side for 5-8 minutes more. They should flatten as they cook. Remove the muffins from the skillet and transfer them to a parchment- or silpat-lined baking sheet. Bake in the preheated oven for 5-8 minutes. Do not wait until all the muffins have been browned in the skillet before moving them to the oven. As the first batch is baking, move the second batch to the skillet. Transfer the baked muffins to a cooling rack and let cool at least 30 minutes before slicing or serving.